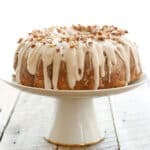 This Banana Bundt Cake with Cinnamon Cream Cheese Icing is a super moist banana cake filled with pecans and then drizzled with a creamy cinnamon cream cheese icing. It’s so delicious, easy, and beautiful to look at to boot! 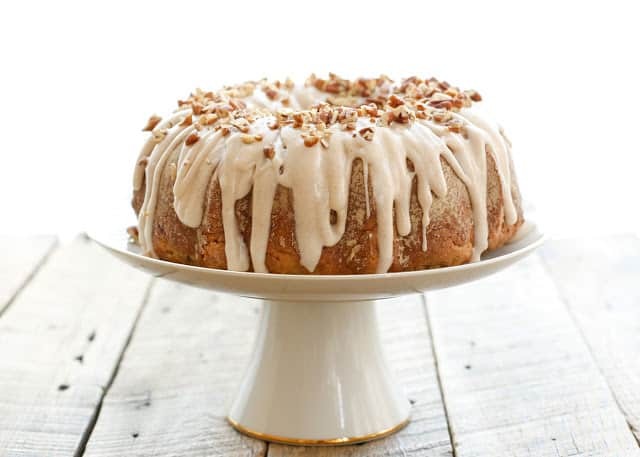 Sturdy enough to slice thick or thin, this banana bundt cake is perfect with a morning cup of coffee, as an afternoon snack, or for a late night dessert. I was first introduced to this cake when we visited my sister Jenny for Christmas. She whipped this up one day during our stay and everyone absolutely loved it. 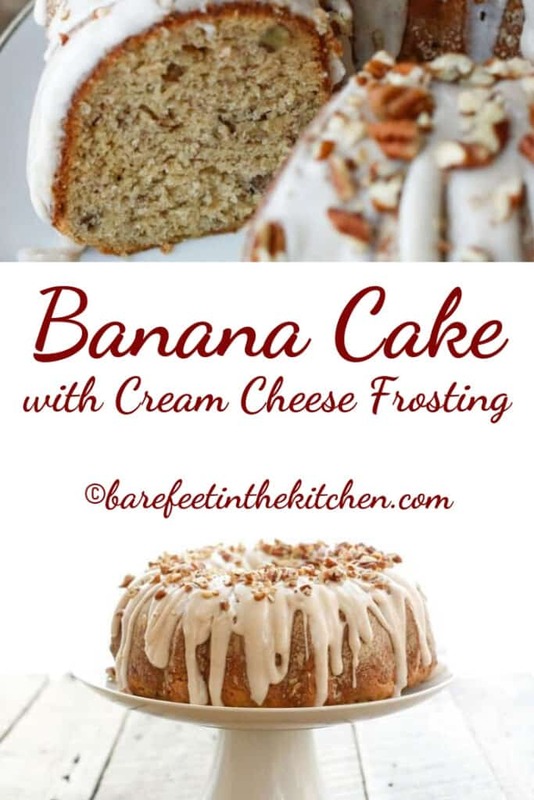 I’ve made my fair share of banana bread and banana cakes over the years but the bundt form of this cake makes this one really something special! When people talk about banana bread and banana cake recipes as a way to use up overripe bananas, I have trouble relating. My kids adore bananas and consume countless pounds of them each week. We rarely have any last long enough to overripen! Typically, when I want to bake something with bananas, I have to plan ahead and hide some bananas so that they’ll have a chance to get a little brown and extra sweet. In fact, I’ve bought pounds and pounds bananas this month in attempts to bake and photograph this cake for you but my kids keep finding them and eating them. I finally lucked out last week when I found several bunches of dark brown bananas at the grocery store. I wasted no time at all in playing with this recipe and baking a few different versions of this cake before my kids could gobble up my materials. Today, I’m excited to finally be able to share traditional and gluten-free versions of this Banana Bundt Cake. If you’ve followed this blog for a while, you might have noticed that we LOVE banana bread in this house. I’ve made so many different variations on banana bread from Blueberry Coconut Banana Bread to Chocolate Chip Macadamia Nut Bread to Sour Cream Banana Bread and as much as we enjoy it in all its forms, sometimes you want something a little different. 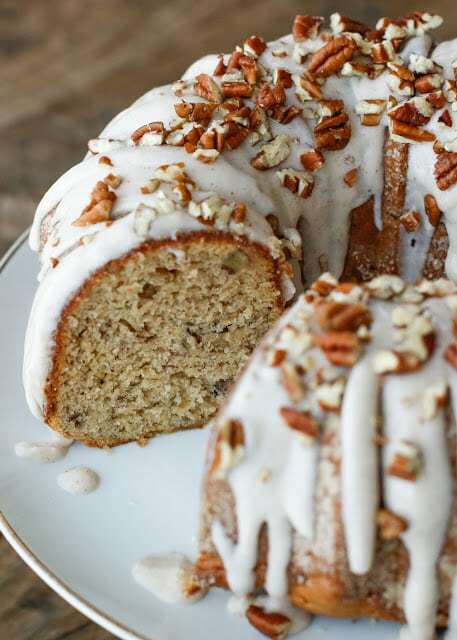 Enter this incredible Banana Bundt Cake with Cream Cheese Frosting. This banana cake is super easy to make and yet the end result is impressive enough to serve guests. It’s beautifully shaped, moist, sweet and rich. And the cream cheese icing drizzled over top takes the whole cake to the next level. I added a little cinnamon to the frosting because, honestly, that cinnamon and banana flavor combination is just too good to pass up. It adds the tiniest hint of sugar and spice to the already delicious cream cheese icing. Instead of fussing with spatulas or pastry bags to decorate this cake, you get to simply spoon the fluffy, creamy frosting over the top. A sprinkling of pecans adds a pretty touch to the finished cake and a nice crunch to each bite. If you’re not a fan of nuts, you can also leave the pecans off. The cake is delicious with or without! The secret to the rich flavor of this cake is all in the sour cream. Using sour cream in the batter helps the cake stay tender and moist without becoming greasy or heavy. If you’ve never baked with sour cream, this is a great time to try. I guarantee you’ll be pleasantly surprised by how well it works in breads, muffins, and cakes. This recipe is also easily made gluten free! I have made this cake with both all-purpose flour and gluten-free flours and my family enjoyed it both ways. Keep in mind that because of the cream cheese frosting, this banana cake does need to be stored in the refrigerator. Put it in an ample sized airtight container or your favorite cake storage container and it’ll keep nicely in the fridge for 3 -4 days. It tastes excellent cold but you can also let it come back to room temperature before serving leftovers if you prefer. If you’re like my family and can’t get enough banana goodness, this site is full of recipes you’ll love. Peanut Butter Chocolate Chip Banana Muffins bring together three of life’s best things (bananas, chocolate, AND peanut butter) in delicious, convenient muffin form. For a breakfast, brunch (or even Breakfast-for-Dinner!) check out my Banana Waffles recipe. Peanut Butter Banana Bread Baked Oatmeal is another breakfast dish that both kids and adults love. For cool, creamy desserts and sweet treats check out Caramel Peanut Butter Banana Milkshakes and this super easy (and surprisingly healthy!) 2 ingredient Peanut Butter Banana Ice Cream. What’s your favorite way to cook or bake with bananas? 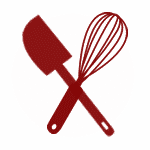 Kitchen Tip: I use this mixer, this spatula, and this pan to make this recipe. Preheat oven to 350°F. Generously grease a 10-12 cup bundt pan with butter and then dust with flour. Set aside. Whisk together the flour, baking powder, baking soda and salt in a small bowl. In a large mixing bowl, beat the butter and the sugar with an electric mixer until light and fluffy. Add the eggs and vanilla and beat again. Stir in the banana, and then add half of the dry ingredients. Stir until combined. Add the sour cream, stir, and add the remaining dry ingredients. Stir until combined and then stir in 1/2 cup chopped pecans. Pour the batter into the pan and spread evenly. Bake about 40-45 minutes, until toothpick inserted comes out mostly clean or with crumbs. Cool 5 minutes in pan and then invert on wire rack to cool completely. To make the icing, combine the cream cheese, powdered sugar, vanilla, and cinnamon in a large mixing bowl. Beat until fluffy, adding a tablespoon of milk and then an additional teaspoon at a time to reach the desired consistency. Spoon the icing over the completely cooled cake and sprinkle with remaining pecans. Serve immediately or refrigerate until ready to serve. Store covered in the refrigerator for 3-4 days. Spoon the icing over the completely cooled cake and sprinkle with remaining pecans. Serve immediately or refrigerate until ready to serve. Store covered in the refrigerator for 3-4 days. Enjoy! Cake is beautiful. So majastic on the cake plate. I believe if a ever marry again this is the cake. Going to make today. Enjoy your site very much. Keep up the good work. Your little helper is getting so big! Love your photos and the cake :) Have a great week! Made this cake today and it was delish. We loved it! I made this and it's amazing!! I wanted to love this so much. I used your gluten free instructions exactly, but it came out so dense with not a bit of cakeness. I actually have to throw it out. That's how bad it is. Perhaps the sour cream and banana mush, along with the 2 eggs were just too much fluid for the gluten free mixture. I could cry. Oh well. There's always another recipe.